Continues through Thursday May 23. 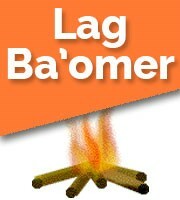 Lag Ba'Omer is the 33rd day of the counting of the Omer. who lived during the Roman conquest of Jerusalem 2,000 years ago.